Over the past few days, midsize banks — such as Comerica, Commerce Bancshares and M&T Bank — have reported notable declines in total deposits, with M&T, in particular, reporting a 6% drop from a year earlier. Executives have offered a number of reasons why, saying during earnings calls that business customers typically draw down cash early in the year to pay for employee bonuses. However, as can be seen on the chart above, the decline seems to be distinctly a regional bank problem. 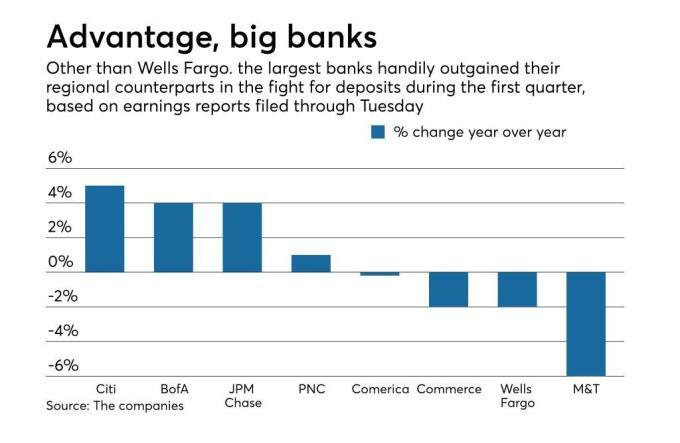 Megabanks — with the exception of the embattled Wells Fargo — reported strong deposit growth during the first quarter. Momentary blip, or precursor to a long-term trend? Something to consider: Customers may be choosing the banks with the best technology rather than those that offer the best deposit rates. That theory made an appearance during Comerica’s earnings call Tuesday, when an analyst pressed executives on whether they are spending enough on tech to keep up with their competition. We use this space to talk about modernization again and again, and for good reason. The signs are pointing to decline for banks that don’t embrace the latest technology at the earliest feasible time. A significant part of our mission with the OrboAnywhere suite of technologies is to make the cutting edge attainable as early as possible to large and small banks alike. Topics like AI, fraud prevention, image analysis, and regulatory compliance are categories which many times are difficult to improve, can be quickly addressed with a streamlined deployment model using web services. In the coming year, for instance, JPMorgan Chase expects to spend an additional $1.4 billion on technology, the company said at its annual investor day in February. That investment will fund what executives describe as the company’s “digital everything” model, including mobile-app upgrades and new back-office uses of blockchain. The challenge is clear… and we’ll be addressing these issues at the upcoming 2018 Healthcare and Check Payment Technology Conference.